Every week we have the sacred privilege of coming unto Christ at the sacrament table. We are commanded to “go to the house of prayer and offer up [our] sacraments upon my holy day”  At that moment we come into the presence of the Lord and account for ourselves, repenting of our sins and taking upon ourselves a covenant to keep His commandments so that we may have His spirit to be with us. If we do these things properly, we are purified; and if we persist in keeping the commandments, we need never be without His presence. Imagine being denied access to the sacrament table. Imagine losing the privilege of coming unto Christ to be purified of Him. That was the situation of the Jews for 70 years after the Babylonian destruction of the temple in 586 B.C. The house of the Lord lay in ruins. The sacred ordinances of the Aaronic priesthood, which gave access to the blessings of the Atonement, could not be performed. So imagine their delight when a new king over Babylon, Cyrus the Great, was moved upon by the Lord to allow the Jews to return to Jerusalem. By this time, most of them had no memory of the holy city. Still, they yearned for the lost privilege of coming into the presence of the Lord and receiving their purification. 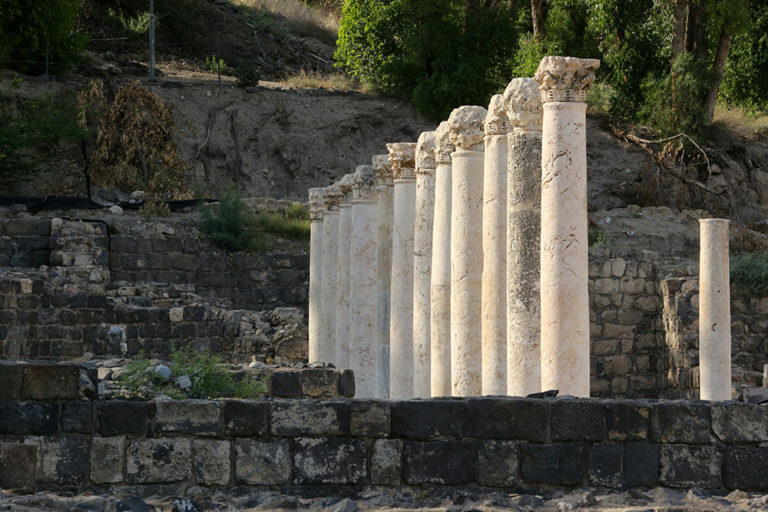 “Then rose up the chief of the fathers of Judah and Benjamin, and the priests, and the Levites, with all them whose spirit God had raised, to go up to build the house of the Lord which is in Jerusalem.”  Within a year they re-laid the foundations of the ruined temple, but two decades passed before the temple was completed. For many years they were forbidden to work on the temple because their neighbors misrepresented their intentions to the imperial government of Persia. At length, however, King Darius I permitted the building to proceed. Much work remained. The holy city was vulnerable to attack because the city walls were in ruins. The Lord inspired a high royal official, the Israelite Nehemiah, to ask of the king leave to move to Jerusalem to restore to the city its defenses. Nehemiah found the people discouraged. The neighbors of the renewed gathering of Israel were hostile. Apparently, their interests were threatened and they schemed to prevent Nehemiah from raising the city walls. Their defense was simple and effective: “We made our prayer unto our God, and set a watch against them” and then went about the work. In every age when the people of God set out to build up Zion, the enemies of God do their best to stop it. The circumstances in Jerusalem of Nehemiah’s time were almost duplicated when the Saints at Kirtland were trying to build the temple there. The mob was so determined to stop the building that the Saints had to arm themselves even while carrying on the work. Once the city was secured, the people called a solemn assembly under Nehemiah’s direction. They invited the prophet Ezra to teach and expound to them the Law of Moses. Ezra became the spiritual leader of the returned exiles as they sought to restore the ancient faith of Israel. In this capacity, he was invited by Nehemiah to teach all the people. Surrounded by the elders, Ezra stood “upon a pulpit of wood, which they had made for the purpose,” and read from the Law “from morning until midday.” The makeshift platform was probably positioned just below the southern wall of the temple so that Ezra could see the people in an open area that sloped down toward the “water gate,” located at the extreme south end of the city (“all the people gathered themselves together as one man into the street that was before the water gate”). The episode of the restoration of the temple in Jerusalem foreshadows our time of restoration. The house of Israel is gathering again, as was done anciently. The ordinances of the Lord’s house are once again available, as anciently. And once again, as in the time of Ezra and Nehemiah, Israel is blessed with the inspiration and direction of living prophets. We can, like those ancient Saints, come to the house of prayer and offer up our sacraments as they did. We can be purified through the Atonement of Christ as they were. We should, like those who built up Zion anciently, have “a mind to work” and build up Zion in our day. Teachings of the Prophet Joseph Smith (TPJS), Joseph Fielding Smith, ed., Deseret Book, 1974, 308. Deseret News, Jan. 12, 1876, p. 788. IV Ezra 5:28, in The Old Testament Pseudepigrapha, vol. 1, James H. Charlesworth, ed., Doubleday, 1983, 528. I suggest that we, too, need to have a weapon in one hand while building the Kingdom with the other. We need "the sword of Truth." We can only wield it if we prepare ourselves with prayer, study, and service. Thank you for this article. It gave me several new insights.